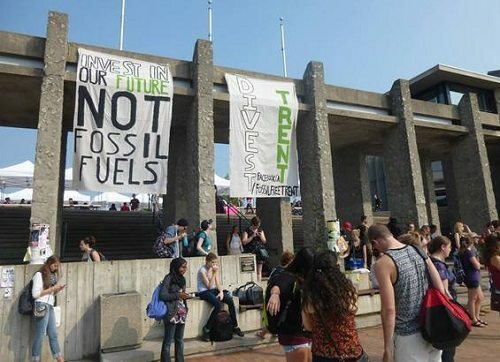 Trent University professor of environmental and resource science Stephen Bocking has written a brief essay in Alternatives Journal on the challenges of divestment. After being impressed with a prominent environmentalist who said he would stop flying as a protest against fossil fuels, Bocking recalls spotting the activist a few years later at a frequent flyer lounge at Toronto Airport. Obviously, even if he were sincere in wanting to stop flying, the environmentalist’s work required it. Living and functioning free of fossil fuels is not easy in modern society. To Bocking, it is a story with relevance to the divestment movement active at a number of Canadian college campuses. The Canadian Youth Climate Coalition began a Fossil Free Canada campaign in January 2013. CYCC’s president, Kesley Mech, describes divestment as “a strong way to send a super-clear message that we’re no longer interested in supporting fossil fuel use.” Bocking says that divestment campaigns like CYCC’s hope to repeat the successes they see as having been achieved in divestment efforts around tobacco, military industries, and South African apartheid. “Divestment is the perfect gesture,” Bocking says. “It feels good, might be profitable, [and] requires no change in personal behavior.” It might even be a moneymaker, in that if fossil fuels become less valuable due to divestment, early divesters will have made a smart investment (or, rather, divestment) decision. He calls divestment a “clear and convenient response to an inconvenient truth.” But he suggests that it is less clear that divestment really makes a difference when it comes to its effect on the climate. Fossil fuel divestment, Bocking says, is different than other divestment issues, because “we can’t separate from fossil fuels—they are mixed up with everything we do.” He adds that the direct impacts of divestment are limited, especially since by universities and other nonprofits selling their shares in fossil fuel companies, those shares will be purchased by investors who in all likelihood have much less interest in changing energy practices and climate change. He also challenges the notion that divestment should be portrayed as a moral issue, calling it a counterproductive strategy. “Threats of shaming don’t usually change behavior—if anything, they make people defensive,” Bocking writes. “Telling people they are immoral is a lousy way to get them on your side.” Rather than divestment, he suggests that activists “work with, rather than shun, the [fossil fuel] industry” to get them to work toward more sustainable energy options. At the University of Dayton, all of these issues and more came to the fore in the university’s decision to divest from investments that have the largest holdings in fossil fuels. Fr. Martin Solma, the vice chair of the university’s board of trustees and provincial, or leader, of the Marianist Province of the United States, described the University’s divestment decision making. In June, the University of Dayton became the first major Catholic University in the U.S.—with an endowment of $670 million and a student population of roughly 11,000—to join the fossil fuel divestment movement. In contrast to Bocking, Solma’s reasoning is essentially a moral argument. He called the decision “a symbolic decision on the part of people of faith,” with the cumulative decision of many Catholic universities, were they to divest, as a major statement about fossil fuels. Notwithstanding the comparatively small size of Dayton’s divestment (approximately five percent of its investment portfolio, amounting to roughly $33.5 million), Solma referenced the response of Mother Teresa to criticisms of her work: “One by one,” he said. Like the intent of the environmentalist at the Toronto Airport, Solma said that the divestment decision accompanied plans on rethinking energy use on the university’s campus with recycling, food services, energy audits of student housing, and other aspects of university life. According to Solma, the university’s policies have to be made consistent with the fossil fuel divestment decision. The difficulty in the divestment decision is actually making it happen. The university can disengage from equity investments in the specific companies on the “carbon 200” list of fossil fuel corporations. However, the investment portfolios of institutions large and small are more complex than investments in specific stocks. Like others, the University of Dayton maintains investments in various investment funds, hedge funds, and other, more complex instruments, which may or may not contain fossil fuel-purveying corporations. The equity disinvestment risk for the university is small, Solma admitted, with “a very minor impact on our returns,” even once the university works through its various funds. Ultimately, similar to Bocking’s assertion, Solma’s analysis is that the university’s divestment decision is a statement within the university, establishing “a higher bar of responsibility.” Anticipating an encyclical from Pope Francis soon on stewardship and public concerns, Solma’s perspective sees the Dayton decision as consistent with the school’s religious mission, but, contrary to Bocking’s assertion, that the university must change its own behavior to be consistent with the principles of the fossil fuel divestment. “We’re doing this in kind of a humble way,” Fr. Solma said.